January | 2007 | Abez sez Assalamualaikum! As I sit at this computer desk with all the wires taped securely to the legs and all the peripherals moved away from the edge of table, I wonder where the time has gone. Bebeface, whose misbehavior was once limited to wiggling alot and peeing on me, has morphed into something else entirely. He has become- Cap’n DangerIsMyMiddleName. Two days ago he unplugged the laptop. The day before that he pulled the wireless signal repeater out of the wall. Last week he reached up to this desk and got hold of the electric drill and very narrowly avoided dropping it onto his head. Yesterday, he woke me up by falling off the bed. It was a different sort of alarm. Instead of beep beep beep the noise went waanh waanh wannh. I woke up in a panic- I could hear Khalid crying but couldn’t find him in the bed. He was on the floor in an untidy heap of baby, his head down and his legs propped against the leg of the crib, looking very offended and somewhat more compact than usual. I scooped him up and went to the kitchen, where immediately, I turned on the microwave. Khalid likes the microwave. In a few seconds, the wails turned to whimpers. Then the whimpers were replaced with the silent hyper-vigilance of Khalid watching the plate in the microwave go around in circles. Then he giggled. All was well and the mighty fall from the bed was forgotten. Khalid is now a little human. Officially. He used to be a little blob, and before that he was a jellybean of some sort. Now he’s a little person who likes chicken, doesn’t want his nose cleaned, laughs at the pictures in his baby books, follows you around with upheld arms, pulls my pant legs when I’m doing dishes, tastes absolutely everything, and plays peekaboo. Really, he plays peekaboo. He will hold things in front of his eyes, wait, and then peek out and smile. Then he’ll do it again. And again and again. Alhamdulillah, SubhanAllah. He’s growing, he’s learning, he’s developing sneakiness. Combine a desire to pull the phone cord with the knowledge that he shouldn’t be, and you get a baby who drops the phone and runs smiling up to me when he’s caught, as if he’s never pulled a phone cord to within an inch of its life before. Oh no. Not me momma, would this face lie? Right now Khalid is laying in my bed (surrounded by a wall of pillows) and drumming his heels on the mattress, growling, and playing with a rubberband simultaneously. In a minute we’ll head to the kitchen for lunch, maybe scoot around the house in the walker later, and then we’re off to Ikea for yet more adventures, so I guess I’ll just finish this blog later. Bebeface & I, over and out! So, what are you up to today? Blurkers, I’m asking you too! 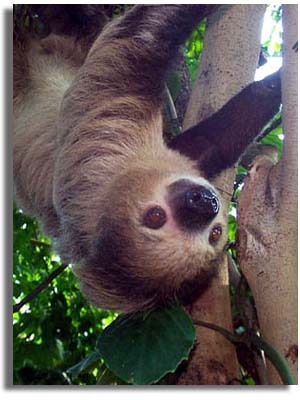 Every now and then I decide I’ve been a wicked sloth monkey. This is a phrase my mother coined that I believe combines all the worst elements of the evil flying monkeys from The Wizard of Oz and the deadly sin of Sloth. As far as eating according to the Sunnah, as far as working out, as far as reading Qur’an and praying Fajr and giving an overall damn about my personal and spiritual maintenance- I’ve been a very bad sloth monkey indeed. I’m still holding on the ten more post-baby pounds, I can’t remember the last time I did a push-up, there’s a layer of dust on my Qur’an so thick that opening The Book may require an archaeological dig… It’s sad, but the good news is, I’m still Captain of the LazyShip Abez, and I say we’re going to change course! I know, I know, I do this often, and the reassuring this is, it works. Considering how often (hu)man slips up, one should be willing to change course however many times necessary to keep the ship from going into the part of the map that says Thar Be Monsters. One should be willing to take correction, to admit mistakes, and if necessary- to make charts. I have a tendency to make charts. I have charts from 1996 until 2000 that count the number of prayers missed a day, every day. They are all titled, “Abez Is An Idiot,” but they mean that in a good way, in a gentle way that means that if I miss prayer for anything less than a coma, I’m an idiot. No water? I can do tayummum. No masjid? All of the earth is a place of worship. No time? Generally, honestly, there’s no such thing as no time. How many minutes does it take to say just the Fard- just the basics of prayer? Five? And how long do I spend surfing the net, taste-testing cereal and installing crooked bookshelves in my bedroom? Too Long. If I can just pray first, just pray before I spend an hour and a half realizing I have the wrong drill bit for cement, then I won’t have to suddenly realize (with dust on my hands and an oddly shaped hole in the wall) that I only have ten minutes left until Asr time begins. I digress. I made a chart. Because I do better with achievable, short-term goals, it is divided into two one-week sections. Each day has a field for Working Out, Reading Quran, and Drinking A litre of Water a Day. The more water you drink, the less hungry you feel, and the easier it is to eat according to what your body needs as compared to what your stomach wants. Starting today, Monday January 8, as soon as I finish this blog, I have to do 30 min of reading/Qur’an, 30 min of working out, and fill a big water bottle and carry it around with me so I drink from it all day. Life is an ongoing process, and Self should always be a work in progress. None of us are perfect, but all of us could be better, InshaAllah. BigBro: I am rubber you’re glue, bounces off me and sticks to you. Me: and is the sky not doing a good job? I mean, when’s the last time you saw a fish get hit with a meteor anyway? Me: alright alright, so there are no bones. That they do sir, that they do.